The iconic Indian wrestling champion Ritu Phogat has made the transition into MMA and has recently signed with Asia's premier MMA promotion and one of the world leaders in the sport of MMA, ONE Championship. The news broke in on 26th February 2018 when ONE Championship released an official press release announcing the signing of Ritu Phogat. Ritu Phogat is one of the most decorated and dominant female wrestlers in India and the World. Phogat used to compete in freestyle wrestling under the 48kgs weight class. Her wrestling achievements include a Gold medal in 2016 Commonwealth Games, a Silver medal in 2017 Under-23 World Championship, and a Bronze medal in the 2017 Asian Games. Ritu Phogat was also ranked no. 5 in the World in the 2018 World Championships and is celebrated as one of the finest young talents in the sport of wrestling, achieving such laurels at a young age of 24 years. Ritu Phogat and her management team had recently announced her transition into MMA and her joining the Singapore based organization and fight team of Evolve MMA. You can read more about the story here. Based out of Singapore, ONE Championship has risen to become one of the premier MMA promotions in the world today. Already the biggest MMA organisation in Asia, with recent marquee acquisitions such as former UFC Flyweight Champion Demitrious Johnson, and former UFC and Bellator Lightweight Champion Eddie Alvarez, ONE Championship has skyrocketed their popularity globally and has become a popular name in the sport of MMA. 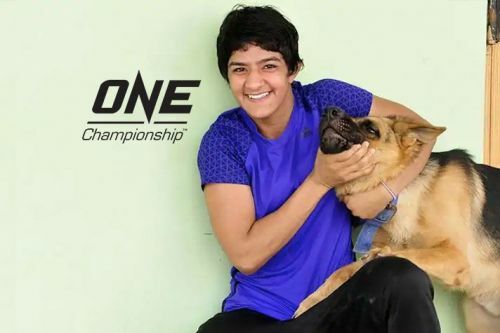 Ritu Phogat has captured the attention of the global MMA and wrestling community with a quick succession of huge announcements of her transition into MMA and Evolve MMA training camp and now her signing with Asia's biggest promotion, ONE Championship. Ritu Phogat has been an iconic figure in Indian sports and wrestling; and her recent move into MMA and ONE Championship is a very exciting development for the sport of MMA in India. It will be very interesting to see how Ritu Phogat develops as a complete Mixed Martial Artist and how can she impose her elite caliber wrestling skills in the MMA cage and possibly, in the UFC Octagon in recent future.